By Commando - *Pastorella by Springfield. Unbeaten Colin has long been considered one of the greatest runners in American racing. He is also important as a progenitor because it's through his male descendants that the Domino male line survives into modern times. 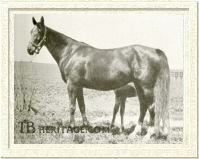 Bred in Kentucky by James R. Keene at his Castleton Stud, Colin was from the third crop by Commando, who died from tetanus in March of the year his greatest son was foaled. His dam, stakes-winning *Pastorella, had produced two foals in England by St. Serf and Donovan, and was imported in foal to Kendal in 1899. Keene purchased her in 1901 when she was offered in the dispersal of Marcus Daly's Bitter Root Stud, paying $10,000, which was the top price for a mare at that sale. The *Pastorella colt was named for the pastoral poem "Poor Colin" by English poet laureate Nicholas Rowe, as an honor to Keene's trainer, James Rowe. It might not have seemed much of an honor at the time, since the colt was born with an enlarged hock. But nothing proved to slow Colin down. He was undefeated in 12 starts at two, and set or equaled speed marks set by older horses on three occasions. He broke his maiden in his debut by two lengths. He won the National Stallion Stakes in his second start, setting a new track record of :58 for five furlongs. Although bucking shins, he won the Eclipse Stakes by a head over Beaucoup, the closest anyone ever got to beating him. He then won nine more stakes that season starting with the Great Trial Stakes, then the Brighton Junior, Saratoga Special, Grand Union Hotel Stakes, Futurity, Flatbush, Produce, Matron, and Champagne Stakes. In the Flatbush Stakes, he equaled the track record at Sheepshead Bay for seven furlongs. He defeated Fair Play by five easy lengths in the Produce Stakes. He carried 129 pounds to again defeat Fair Play (122) in the Matron Stakes. In the Champagne Stakes, he set a new American record of 1:23 for seven furlongs. At three, Colin started only three times, opening the season with a whirlwind score in the one mile Withers Stakes by two lengths over Fair Play and King James. He went into the 1 3/8 miles Belmont Stakes with rumors that he had bowed a tendon in his previous effort, and had actually pulled up lame in his last workout prior to the classic event. His trainer, James Rowe advised against starting in the classic, but Keene insisted his horse was good enough to overcome anything. Colin won the Belmont by a furious head over Fair Play in a heavy rain, both horses full extended. Following that race there continued to be talk that Colin wasn't right in one foreleg. He returned in the 1 1/4 miles Tidal Handicap three weeks later, which he won with ease by two lengths over Dorante. This victory proved to be his last race. In June of 1908, betting on racing had been declared illegal in New York, and Keene, like many Americans, sent a substantial string of horses to England to race. Colin was among them, given to Sam Darling at his Beckhampton yard. Colin trained and won a trial, but went wrong in that weakened leg before he could start as a four-year-old. He was finally retired with a record of 15 wins in as many starts and earnings of $178,100. 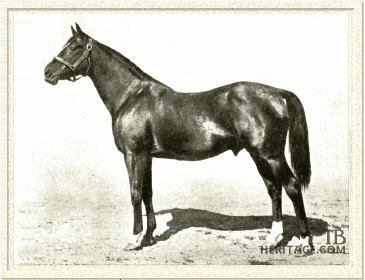 The American-bred son of Commando stood his first season in 1909 at Heath Stud, near the English breeding center at Newmarket, for a fee of 98 guineas. Despite Keene's pride in the great colt, fortune cast one last blow. Colin proved extremely infertile, and English breeders looked elsewhere. Only one foal from his English excursion left the slightest influence, the colt GENTLE SHEPHERD (out of Yesterling by Sterling) who sired Shepherdess, the second dam of the sprinter *Fair Truckle. James R. Keene died in 1913 and the Castleton Stud bloodstock was dispersed on September 2, 1913 at Madison Square Garden in New York. Colin, who was still in England at the time of the sale and whose fertility problems were already common knowledge, was purchased for $30,000 by Wickliffe Stud, a partnership between James Corrigan and Price McKinney. After only five years, the Wickliffe bloodstock was dispersed on January 15, 1918 and the 13-year-old Colin was purchased for $5,100 by Edward B. McLean, who stood the horse at Captain Raymond Belmont's (son of August Belmont II) Belray Farm, near Middleburg, Virginia. It was here that Colin died in 1932 at the age of 27. As a stallion, Colin was a mixture of success and failure. 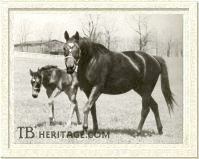 He suffered from serious fertility problems, getting only 83 foals in 23 crops, but of those, 11 were stakes winners, for an excellent 13 percent, and his name persists in enough important pedigrees to hint that had he been a normal foal-getter, his stallion record would have been much more impressive. His best runner was JOCK (1924 out of Kathleen by *Sempronius), a tough campaigner with 17 wins in 68 starts and $95,255. Stakes-placed at two, he was a stakes winner at three, four, and five, and was placed third in the 1927 Kentucky Derby. He was not a good sire, however, with only five stakes winners. Another good one was NEDDIE (1926 out of Black Flag by *Light Brigade), a stakes winner at two, and the sire of Good Goods, who sired the champion Alsab. ON WATCH (1917 out of Rubia Granda by Greenan) was a stakes winner and the good sire of stakes winners War Plumage, Sortie, Tick On, Time Clock, and the broodmare Stop Watch, who produced the champion Stymie. On Watch also sired Sortie's winning brother Brazado, who became a useful sire for King Ranch, getting Curandero and Flash Burn as well as Rocket Gun, the dam of champion High Gun. Several Colin daughters became good broodmares and show up in influential pedigrees. SLOW AND EASY was the dam of three stakes winners as well as Easy Lass, dam of champions Coaltown and Wistful. 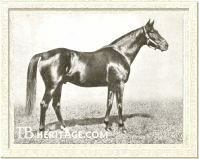 HERD GIRL produced the champion racemare Late Date (dam of War Date, Beau Busher, and important broodmare Stolen Hour). Stakes winner DREAM OF ALLAH produced Time Maker. Garden Rose, a sister to Dream of Allah, produced the good runner and sire Rosemont. Dina Did produced He Did. COMIXA produced Sun Mixa and Lady Nicotine. Colin was a big horse, on the leg but well-balanced with powerful muscling, especially in his hindquarters. Like his sire, Commando, he was not the most refined specimen and his profile was somewhat roman. A seal brown horse, he had a star on his forehead, separated from a narrow blaze that began half way down his muzzle and ended in a snip going into his right nostril. He also had three white feet, the left front ankle, left hind ankle, and right hind with a half stocking. Despite all efforts toward extinction, first with Domino's death after two seasons at stud, then with his son Commando's death after only four seasons, and despite Colin's serious infertility, the male line of Domino has managed to survive into the 21st Century. From Colin, it passed through Neddie, sire of Good Goods, sire of Alsab, sire of Armageddon, sire of Battle Joined, sire of Horse of the Year Ack Ack, who sired of America's 1994 Leading Sire Broad Brush. Real tribute to the greatness of Colin lies in the words of his trainer, James Rowe Sr., one of the greatest trainers in American racing history. He wanted for his epitaph three simple words: "He trained Colin." COLIN, Brown colt, 1905 - Family 19 - b.